Machin definitives, catalogues and albums - how's your collection formed? Good news and bad news for collectors recently. First the good news: Stanley Gibbons' GB Concise 2016 Catalogue will be published on 31st May, and our own detailed Checklist with cross-references and sources. All new versions of the checklist are available from Dropbox. The Gibbons product will include all the new definitive and Post and Go stamps and, of course, all the commemorative stamps, booklets and generic sheets, probably until March of this year. Following requests I have now restored the Gibbons-Norvic cross-reference and the list of issue dates to the main listing in our Checklist which now runs to 32 pages. In ensuring that tables are not unnecessarily split there maybe more white space than usual, but doubtless that will soon be filled up by more new stamps! Now, those collectors are faced with adding extra stamps to their collection - no mean (or cheap) feat 7 years down the line - or discarding the unwanted pages which, as the introduction indicates, are "intended to work independently" to show all Machins which have one or more date codes. Of course if collectors do use these pages, they can be assured that they will have to discard many of them next year, and pay for a new set. Here is one of the pages for the 2nd class blue (the counter sheet stamps, U2945, are on an earlier page), with my additional notes on sources. 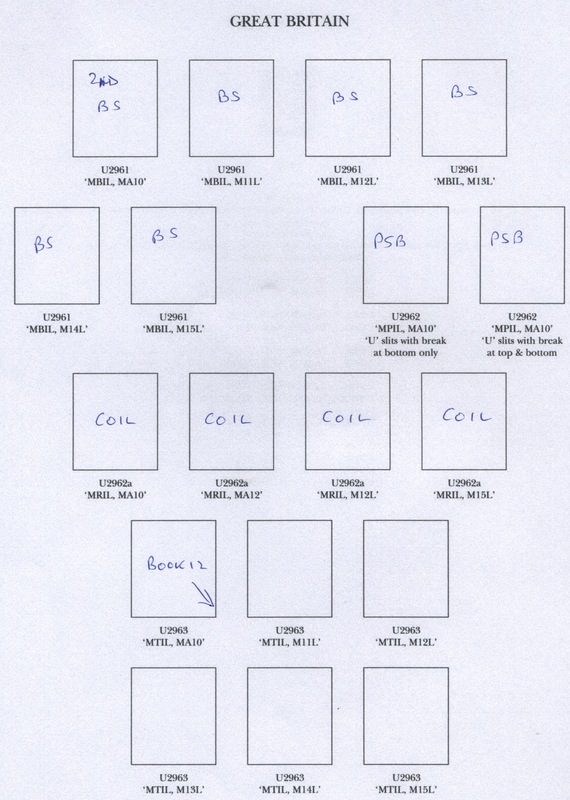 This includes the six business sheet stamps from 2010-2015; the six booklet stamps from 2010-2015; the four coil stamps: one for 2010, two for 2012, and one for 2015; and two variations of the one that was included in the 2010 King George V prestige stamp booklet. But already we have the 2016 booklet and business sheet stamps, thus necessitating a replacement next year. Some of the stamps for which there are spaces in the supplement are easier to acquire than others. If you collect mint stamps, then you come will have a problem with U2962a. In the 2015 Concise the issue date is listed as '(6.12)' that is, June 2012. But the album shows a space for one with the year code MA10. We know that this was first discovered in July 2011, so why is that not mentioned in the 2015 edition of the catalogue? Because it is only known in used condition - a fact noted in the table on page 348. So collectors of mint stamps will forever have a space unless they exceptionally use a used copy here. The PSB stamp for which two spaces are provided also gets a mention in that table where the existence of both types, first reported by us shortly after the 2010 exhibition, is noted. But it isn't mentioned in the catalogue listing, not even as a footnote. What does this tell us? That whether or not you get the stamps from your local post office, from Royal Mail's bureau, or from me or another dealer you should get them early, while they are available. * Some printings were never plentiful and the prices in the Concise table reflect this - the 2nd Large MA10 business sheet, the two Recorded Signed For MA10 stamps, and the 2nd Large MA10 booklet stamp are all priced £14 or more, much higher than their contemporaries, reflecting their scarcity. Try as we might, further supplies eluded us. They should have been in post office branches, but they aren't even plentiful in used condition from kiloware. * A few words of clarification. As explained below, the most common stamps are the booklet stamps, which many collectors find in their supermarkets or card-shops, even if they never see particular types in the post office. I try to obtain as many as I think I will need to sell both as whole booklets and as singles, but my supplier has his customers to satisfy too! Most collectors don't buy business sheets, which are sheets of 100 small stamps and 50 Large Letter stamps. I aim to get an initial stock of 100 of each stamp, that is one sheet of small and 2 sheets of large, but that doesn't always happen if the source has only a few sheets. Depending on demand I'll try to get more and may be able to add a further supply later. But quite often the source is replenished with earlier printings, and I can't get a large quantity. It's quite an interesting balancing act! What if you have a used collection, which are the sleepers there? Well, look at your incoming mail - that small amount that is stamped. The most common 2nd class usage is from booklets (MTIL) or business sheets (MBIL), and the most common 1st class usage is the same, and then the other two booklets (MSIL and MCIL). What's missing? - the similar stamps from counter sheets - MAIL. In the case of the 1st class stamps this is because of the volume of 1st class special stamps issued, which some branches find is quite sufficient and they never order the Machin sheet stamps (let alone the Country definitive - that is another story!). In the case of the 2nd class, social users buy booklets, businesses that use stamps buy business sheets. So these two (right) which arrived here recently deserve a place in my collection of used on cover. The lower one is the M15L coil on a mailshot from Laithwaite's, but the upper one is the M15L counter sheet MAIL, from a friend without a computer. This might be the first one of these I've seen on a letter - it would be ironic if the coils have been more collected than used counter sheets! I've been pondering for some time how a collection of one of each of these stamps is best stored. Even if you choose a stockbook there are options. Do you collect by face value, or by year? Certainly collecting by year will mean less rearranging as, these days, few stamps appear during the year with the previous year's year code. How do you keep yours? And do you collect used on cover? If you do, and have gaps, I may be able to help with some clearly dated commercial covers. I've been sent this analysis by Trevor, who sorted four weeks' office mail. A surprisingly high number of 2nd class stamps from counter sheets (11) though there were far more from books of 12 (57), and only three 1st class counter sheet stamps, one red and two purple. Thanks Trevor. Not only did Gibbons miss the space for U3020a they also forgot to reprint the pages for the Irish, Scottish, & Welsh regional stamps in the supplement. These are not expected to be issued until the 1st 2 weeks of June, I find this very remiss of such a high profile company. It seems SG are having to pretty-much guess what the Royal Mail are doing, the same as the rest of us! Gibbons rarely anticipate what Royal Mail is going to do, although they do leave spaces in the numbering on occasion. But if the pages are supposed to be up to date to a certain point, you would hope that they have been compiling a list of all additions so that they can put them all in the album.